"Folks said Rosie could fiddle the flowers out of their buds. They said she could fiddle the stones out of the ground. Folks said Rosie O'Grady could out-fiddle the devil himself..."
And so the reader is drawn into the tale of "Rosie's Fiddle" by Phyllis Root. "Rosie's Fiddle" is just one of many enchanting children's books that use the fiddle in their storyline. 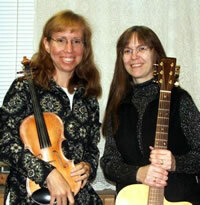 In the Fiddling with Books program presented by guitarist Dannielle Swart and fiddler Hope Grietzer, a selection of these books are presented and brought to life with accompanying fiddle tunes and singing songs. The hour long program introduces books for all ages that include fiddles, fiddling, fiddlers, or traditional tunes that can be played on a fiddle. Several of the tales are set in places where a strong cultural heritage has expressed itself in music, such as Appalachia, Quebec, and Ireland. Other books depict times, such as pioneer days, the Civil War, or the early Industrial Age, when music was used to tell stories or to help lighten heavy loads. The fiddle tunes flow with the tales in the books, bringing the stories to life while the audience is laughing, clapping, and singing along. Following the performance the children are encouraged to peruse the books that were presented, while a question and answer period allows them to satisfy their curiousity about the fiddle, banjo, and guitar. For more information on booking this program for your library, contact Dannielle Swart at danniellerae@gmail.com. Dannielle and Hope were a delight! Their fiddling program was entertaining as well as educational...the children were truly inspired. One of the best programs we had all year. Bonnie Schweizer, The Dutton S. Peterson Memorial Library, Odessa, N.Y.
performance at the Watkins Glen Library . Parents and children are still talking about it, and we have more than one budding musician because of it. You both were so informative and entertaining, especially with such a large crowd of varied ages. We all enjoyed the music and of course, the books. Keep up the good work! Carol LaFever Watkins Glen Public Library, Watkins Glen, N.Y.